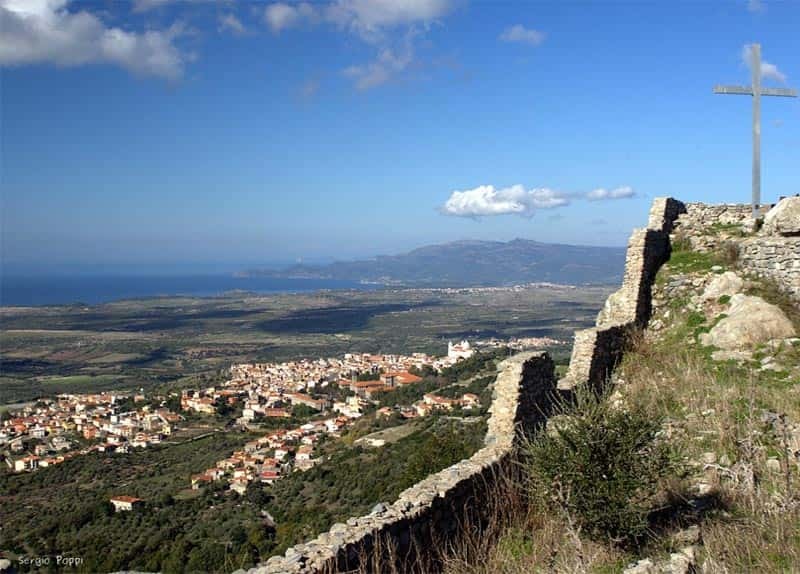 cuglieri is a completely mountainous coastal municipality of 2.671 inhabitants, located at 483 meters above sea level Province of Oristano, Its territory covers an area of ​​120,50 sq. km. On the western slope of Montiferru, with a panoramic sea, Cuglieri is a big agricultural village and pastoral 500 m above sea level. The village lies at the foot of the imposing church of Santa Maria della Neve, from the eighteenth-century façade flanked by two towers. It can be reached by a pleasant walk uphill from the main road that winds through narrow alleys and stairways between high stone houses. From the square of the Hill Barodus front of the church, the view extends from the red roofs of the village to the coast between Santa Caterina di Pittinuri and Alabe. St. Catherine of Pittinurri is a seaside resort built around the cove of white pebbles, enclosed by a limestone cliff dominated by the Torre del Pozzo, built by the Spaniards. This stretch of coast is very scenic with limestone cliffs and sandy beaches and white stones. The most famous is S'Archittu, a large arch carved into the cliff by the force of the waters. A dirt road leading from the state 292 between Santa Caterina and Pittinuri S'Archittu, leads to the ruins of the Punic-Roman city of Cornus where, in 215 in. C., was fought the last battle between the Romans and the Sardo-Punic led by Amsicora. In the ninth century the town was abandoned because of continuous Saracen raids and the inhabitants moved in the hills and founded a new town, curulis Nova, the current Cuglieri. The road ends just before the establishment of paleo-Christian Columbaris, while the acropolis of Cornus is located on the hill south-west. The archaeological area looks abandoned, but you can find some sarcophagi and the remains of a basilica with three naves, probably dating from the sixth century. Do you want to contribute to the completion of this page dedicated to the country of cuglieri?